Bedrock Golf Cub is a privately owned, challenging, nine-hole, par 36 golf course operated by the Carr Family. Former PGA Tour Professional and current PGA of America member Joe Carr has served as Bedrock’s Golf Professional since the club’s inception on May 23, 1992. The amenities offered include a scenic course carved through the Rutland woods, fully stocked pro shop, practice putting green, motorized carts, pull carts, tournament schedule and the “Back Nine Pub”, a full service bar and grille. Bedrock is located 10 miles west of Worcester. Bedrock offers full and limited memberships, public play, evening leagues and outings for businesses and social groups. Call for information on any of our programs. Our beautifully wooded 9-hole course here at Bedrock golf Club weaves through the trees for 3,463 yards of golf from the longest tees. 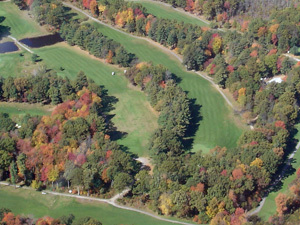 The course was designed by Bill Greene and Joe Carr.